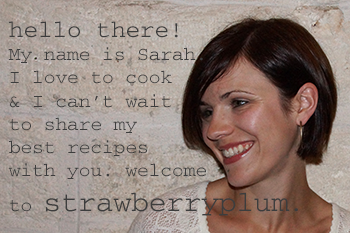 When people discover you have a food blog, suddenly everyone has a great idea for what you should cook next. I get a whole lot of (well-intentioned) requests for things like gluten-free baking ideas, cute holiday treats, and homemade girl scout cookies/bloomin’ onions/pumpkin spice lattes/etc. In other words, I often find myself gently reminding folks that I’m capable of eating an entire baguette on my way home from the grocery store so gluten-free baking is really not something I have a huge interest in, that “cute” is something I do very poorly, and there’s this special place called Pinterest where I’m sure those “top-secret” recipes you want me to recreate already exist. Umm…yes, absolutely! Finally, a suggestion I didn’t have to politely turn away! So armed with Vincent’s recipe, I went home to make Parisian gnocchi. 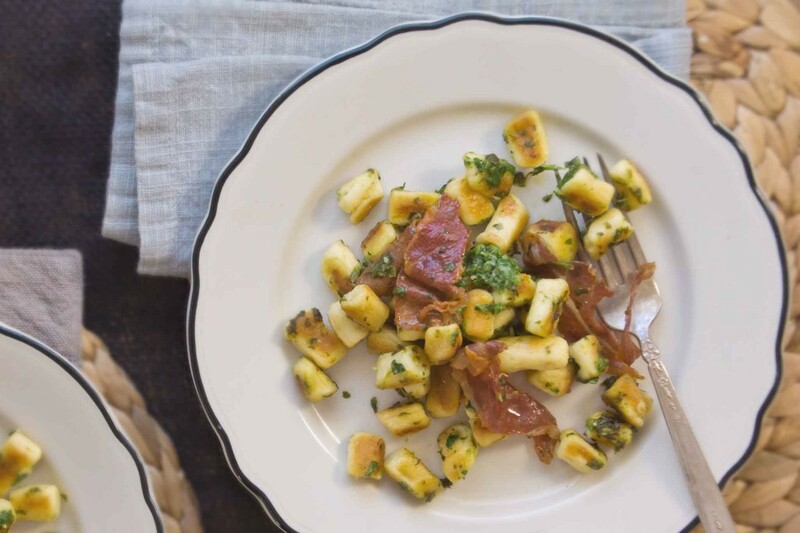 Parisian gnocchi are unlike the Italian gnocchi you’re probably more familiar with. Instead of relying on potatoes, Parisian gnocchi are made with cheese-enriched pâte à choux, which is the same type of pastry dough that’s used make gougères, profiteroles, and other such treats. 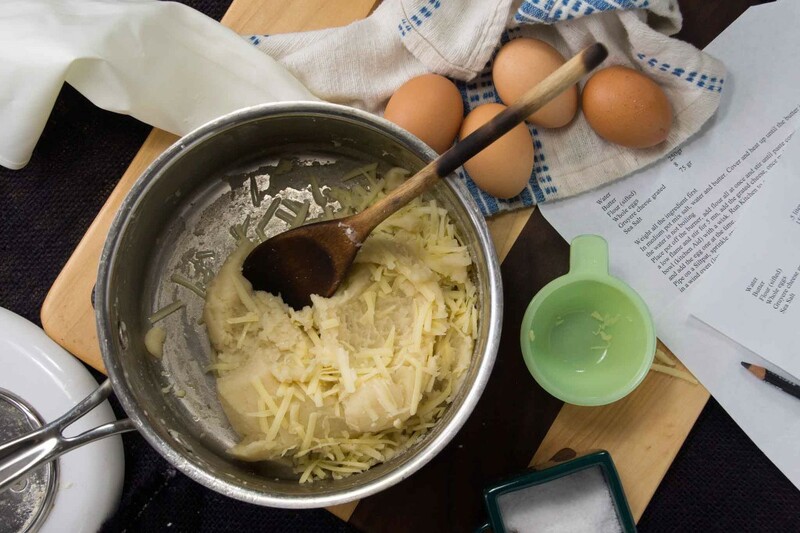 Yup, copious amounts of cheese, butter, and egg–leave it to the French. The cheesy choux pastry is piped into simmering water and poached. From there, you can go ahead and eat them or shock them in cold water, then sauté and sauce them later. I’ll walk you through the how-to and show you how I served mine. 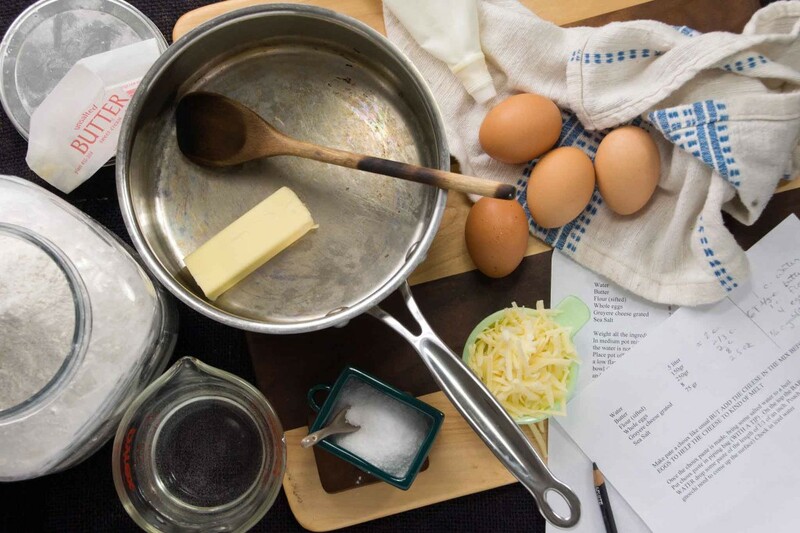 To make Parisian gnocchi, you’ll need butter, eggs, flour, salt, cheese, and water. Start by combining the butter, water, and salt in a saucepan and bringing it to a near-boil. Dump in flour and stir. It’ll look a little chunky at first , but keep going and soon you’ll have a smooth, thick paste. Let it cook for a few minutes to let the raw floury taste cook out, then stir in some grated Gruyère. I’d like to mention that the recipe I was working from was written very much in my boss’s voice. I kept looking over my shoulder, half expecting him to materialize out of thin air as he always seems to do at the restaurant to inform me that my apron was dirty or my shirt was too wrinkly. Didn’t happen…phew. After the cheese has been mixed in and melted, transfer the blob to a stand mixer and beat it for a few minutes to cool it down. Now beat in a few eggs, one at a time, until the dough is smooth and shiny. Transfer the pâte a choux to a pastry bag. We’ll form and cook the gnocchi all in one fell swoop. Hold the pastry bag in one hand over a pot of simmering water and gently squeeze it so the dough comes out slowly, but steadily. Hold a small knife in your other hand and, as the dough is extruded, cut at half-inch intervals, letting the little pieces of dough drop into the pot. This sounds more complicated than it really is–I’m the least coordinated person out there and I pulled it off without issues. Let the gnocchi poach for a few minutes until they’ve cooked through. At this point you can grab a plate, load it up, top it with a bit of grated Parmesan, and simply get at those little gnocchi. The alternative is to shock them in an ice bath and sauté and sauce them later. 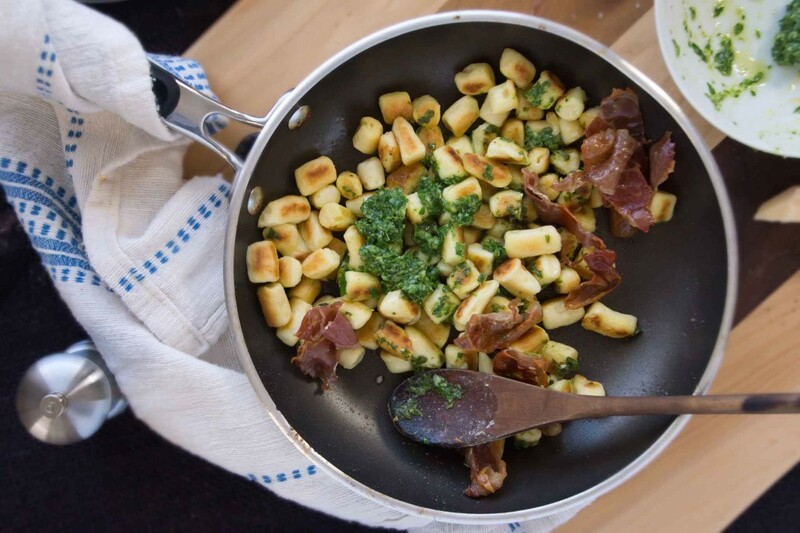 To finish the dish, I sautéed the gnocchi until golden, then tossed them with arugula pistou and a few pieces of crisped up prosciutto. I kept it pretty simple so the gnocchi would be the star of the show. As I’m looking back at all these pictures, I’m realizing it looks like a really time-consuming endeavor. It actually wasn’t. In fact, I found Parisian gnocchi to be way less finicky than potato gnocchi and, as a bonus, you can make them hours or a day in advance so finishing them off takes mere minutes. I’m glad my boss was willing to part with his recipe and I’m glad I get to pass it on to all of you. Happy cooking! Parisian gnocchi are light, airy cheese dumplings that are made from poached pâte à choux. 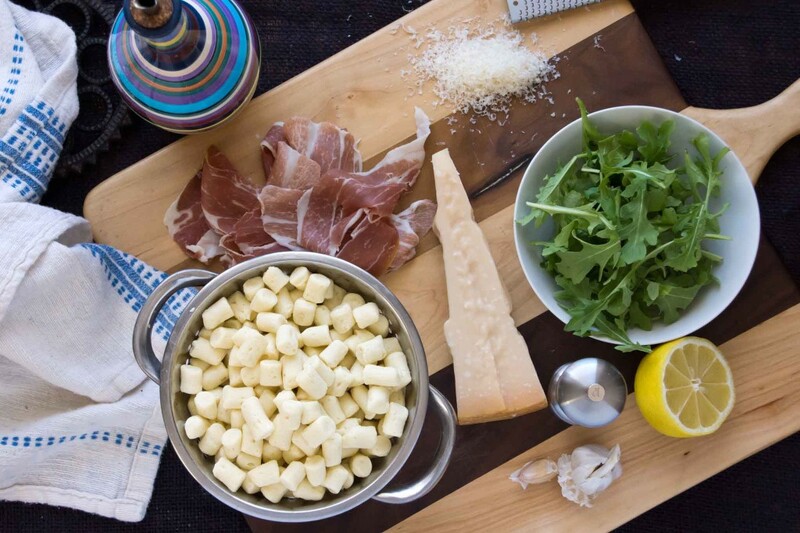 Enjoy them on their own, with a sprinkling of Parmesan, or with a simple sauce such as the arugula pistou seen below. Place the butter and salt in a medium saucepan with 1 c. water. Place the pan over medium heat. Let the butter melt and bring the mixture to a simmer. Once the mixture has reached a simmer, remove the pan from the heat and stir in the flour. 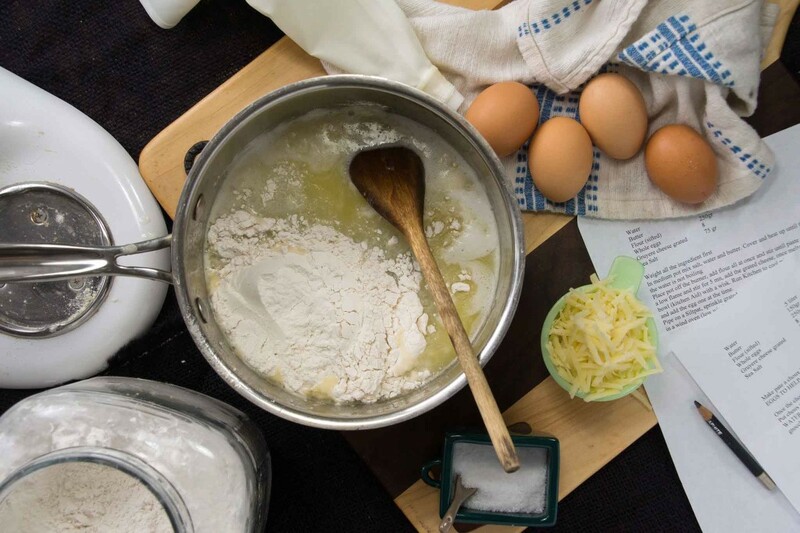 Stir with a wooden spoon until the flour has been incorporated and the mixture is a paste-like consistency. Now place the pan over a low flame. Cook, stirring, for about 5 minutes until the mixture pulls away from the pan in one large clump, is smooth and has darkened slightly. Remove from heat and stir in the cheese. 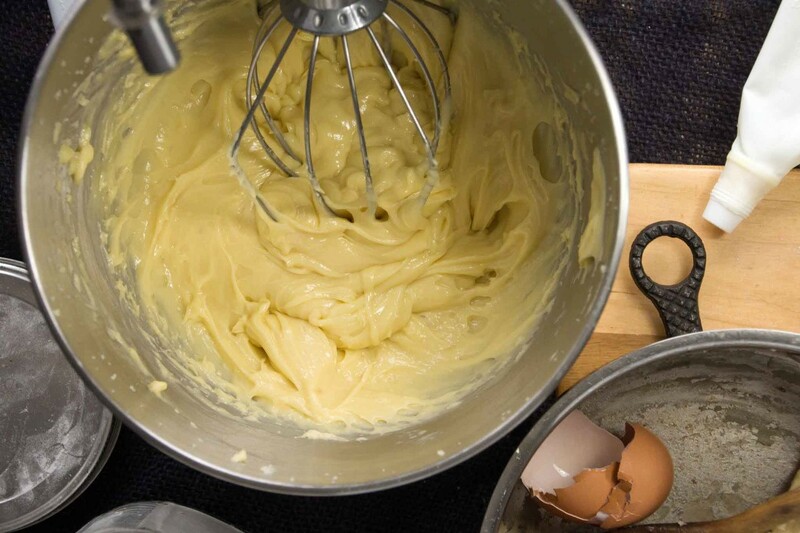 Transfer the mixture to the bowl of a stand mixer and beat for a few minutes until the mixture has cooled down somewhat (you want to avoid making scrambled egg!). 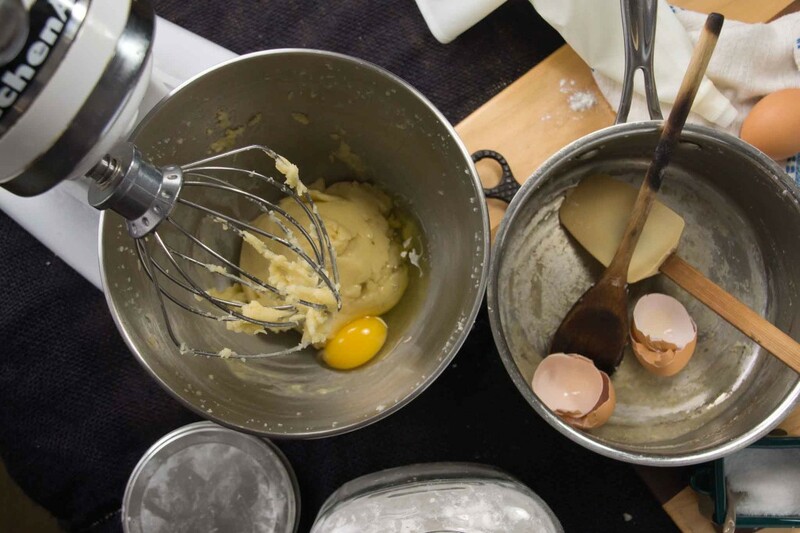 Once cooled, add the eggs, one at a time, and beat until the dough is smooth and shiny. Bring a large pot of salted water to a simmer and prepare an ice bath. Transfer the dough from the mixing bowl to a pastry bag. You'll need to make the gnocchi in a few batches so they won't be crowded. Hold the pastry bag in one hand, just above the simmering water, and gently squeeze so the dough comes out slowly and steadily. Have a small knife in your other hand and as the dough is forced out, cut it crosswise at ½ inch intervals and let them fall into the pot. Work quickly as you'll want to get a bunch into the water at approximately the same time so they'll finish cooking at the same time. Let them poach for about 5 minutes, then remove with a slotted spoon, and plunge into the ice bath (or skip the ice bath, put them on a plate, and grab a fork!). 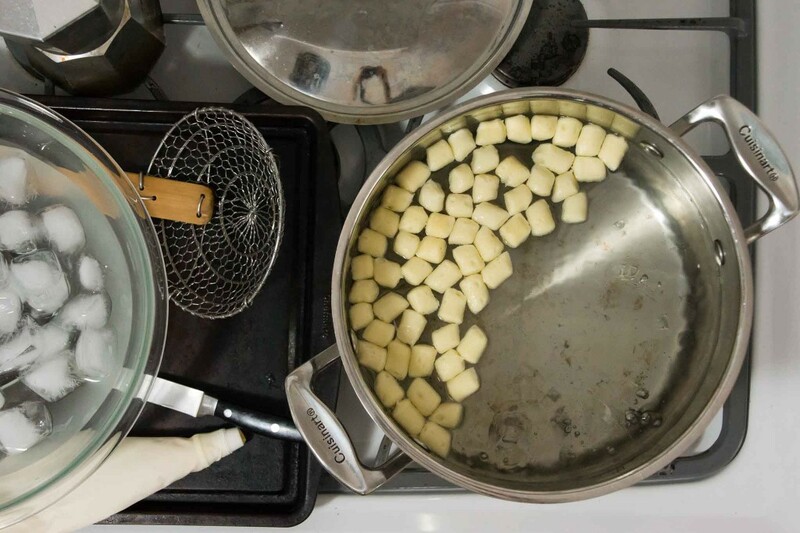 Drain the gnocchi and refrigerate until you are ready to serve them. 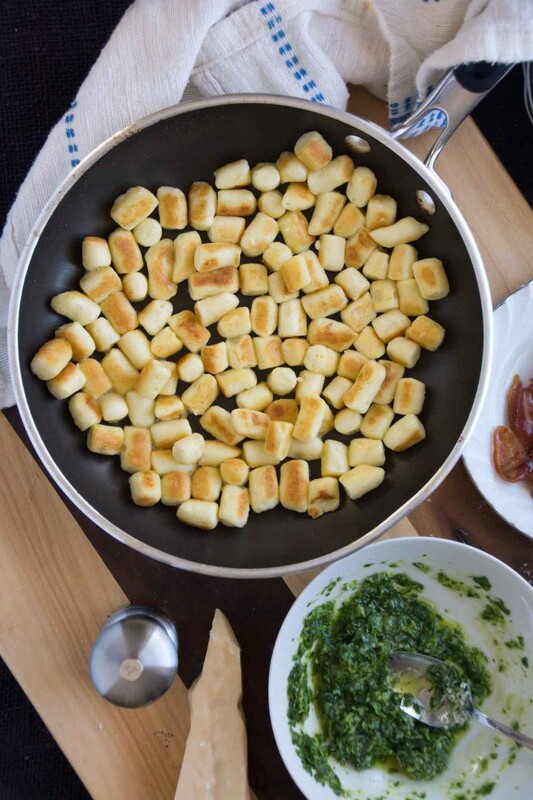 When you are ready to serve the gnocchi, heat a Tbsp. or so of butter or olive oil in a large non-stick sauté pan. Add the gnocchi and let them cook, undisturbed for a couple of minutes until they are golden on one side. Give them a stir and allow them to get a little color on the other sides. Sauce the gnocchi as desired and serve immediately. Pistou is essentially pesto without the pine nuts. To make it, simply smash a couple of cloves of garlic and a handful of herbs (or arugula in this case) into a paste, then stir in grated Parmesan and olive oil. Using a mortar and pestle or a food processor, smash or process the garlic into a paste. Add the arugula and work it in until the whole mixture is fairly smooth. Stir in the olive oil, lemon juice, and ¼ c. Parmesan. Taste and season as needed with salt and black pepper. Place the torn-pieces of prosciutto in a large sauté pan over medium-high heat. Cook for a few minutes, turning once, until it is crisp. Remove from the pan and set aside for the moment. 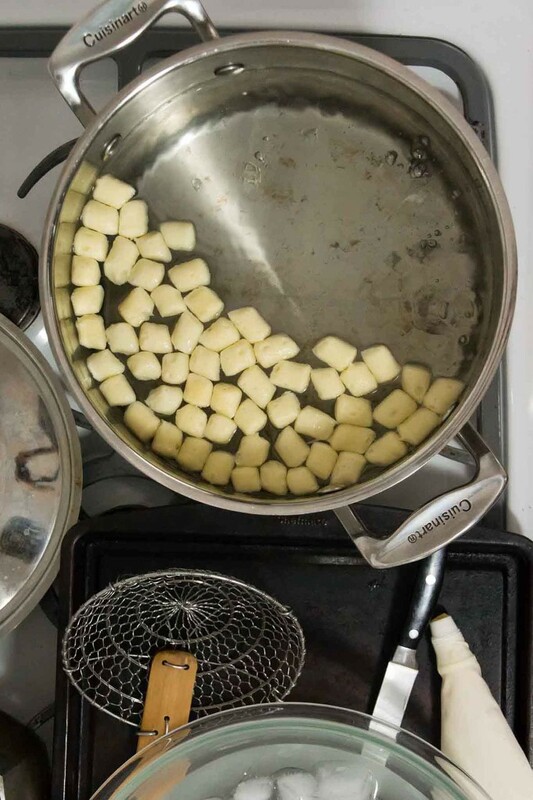 In the same pan, cook the gnocchi as directed above. 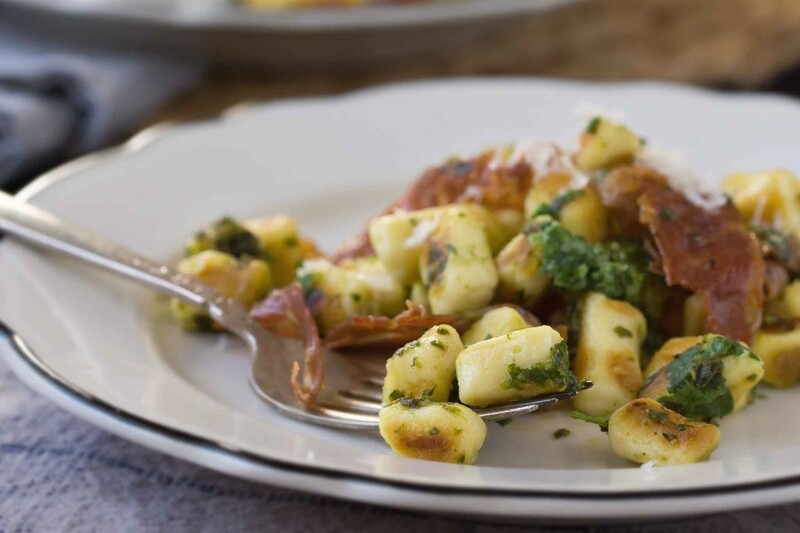 When the gnocchi are golden, remove from heat and toss with the pistou and crisped prosciutto. Divide between warm plates, top with additional grated Parmesan, and serve immediately. WOW! All my favorite things! These look wonderful! When can you make them for us???? ?